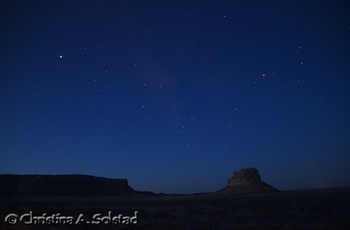 The night sky at Chaco Canyon can be breathtaking. I braved the cold a few times to take photos of the stars, and describe my experience and provide some tips for you below. 1. I got up early one morning before dawn, excited when I noticed that the stars were visible. It had been stormy the previous afternoon and evening, with rain and some snow. However, by the time I got bundled up (it was cold!) and set up my tripod and camera outside, the clear patch in the sky had been replaced by a thick layer of clouds, followed by a brisk wind and some snow. As dawn slowly lightened the sky, I could see that my car was covered in white icy snow, and the ground was white! 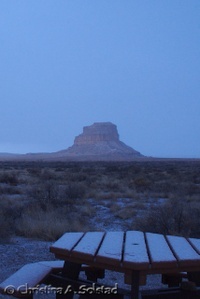 See Why It Is Difficult to Leave Chaco Canyon for the photos I did get of the snow before my fingers froze. 2. 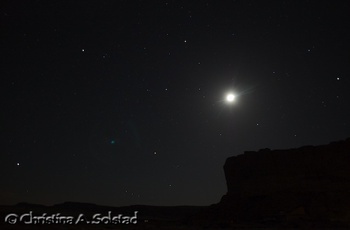 I headed out again that night, when I noticed clear sky and stars, with a bright crescent moon. I couldn't see much in my viewfinder or LCD display. I persisted, and kept adjusting settings (ISO, f-stop, shutter), taking photos, and hoping for the best. Even with the bright moon, stars are visible! 3. I got up again the next morning before dawn, bundled up, set up my tripod and camera, and took as many frames as I could before the predawn light replaced the stars and night sky. Again, I kept adjusting camera settings. Good thing digital cameras record the details. I like the result! 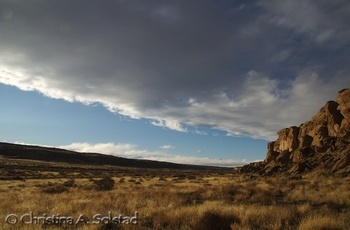 Chaco Canyon - both the place and the people - envelops you in its magic, making it difficult to leave. I have found this to be true every time I visit. I just returned from Chaco - a week later than planned! Can you relate? This is the first time I was actually able to stay, since I have created my work (editing and writing) to be mostly mobile. Hence my lag on blog posting, since I was without internet access for over a week longer than expected. Oops! The good news is that I have lots to write about for upcoming posts, after nearly a month in fabulous northern New Mexico: Santa Fe and Chaco. See what I wrote about the spring equinox in several earlier posts. Why couldn't I leave (i.e, my excuses)? My friends, the park rangers and volunteers, twisted my arm really hard - honest! OK, so my arm twists easily, and I am good at doing it myself. I needed more time in the canyon, to do all the back country hikes, and visit all my favorite sites (a common excuse). I volunteered to stay and help when it was expected some large groups (~150 and 75 people) would be coming into the canyon (The Longest Walk 2 and the Hopi Sacred Runners). Turns out they did not come through as expected, but it sure would have been interesting to see them. Then the stormy weather made leaving on the south road potentially dangerous, so I waited for better weather. I got to see snow! Tried taking some star photos, then had to wait for more clear night sky to try again! I did get some decent shots, to be posted later. What else is it about Chaco that makes it so difficult to leave? 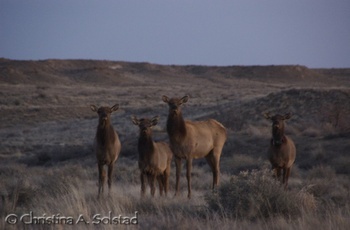 Did you know there is a herd of about 50 to 60 elk in Chaco Canyon that migrated into the park in 2000? The first time I actually saw them was last December. And I saw them again this March. I was thrilled! Most sightings seem to be at dawn or dusk. 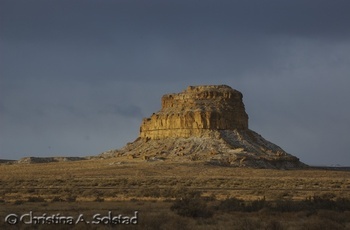 I have seen them along the south side of the loop road, between Casa Rinconada and the Fajada Butte view turnout. Most recently I saw them off the south road, just at the southern park boundary at sunset (see photos). 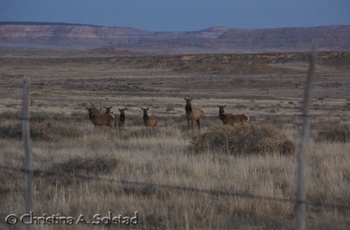 They are also seen near Fajada Butte. There are times you can hear them "rutting" in the distance - a very eerie sound. Be sure to look for their footprints in the Chaco Wash, as you hike to Penasco Blanco, or as you cross the wash on the bridge south of the visitor center. According to Medicine Cards, based on Native American teachings, the elk represents stamina, and teaches that pacing yourself will increase your stamina. This is something I continue to learn in my own life. I have much to learn from nature's wisdom. 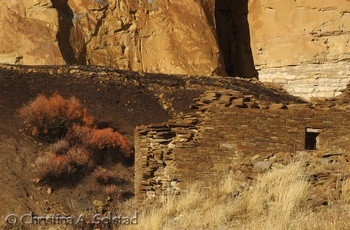 Perhaps you will be lucky enough to see elk at Chaco Canyon! There is a total lunar eclipse tonight, February 20/21, visible in most of North America, weather permitting. It should also be visible from South America, Western Europe, Africa, and western Asia. During a total lunar eclipse, the Moon's disk can take on a dramatically colorful appearance from bright orange to blood red to dark brown and (rarely) very dark gray. See the NASA total eclipse webpage for more info. Hopefully you will get to see at least part of the eclipse. 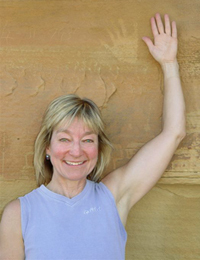 Imagine what it must have been like to see a lunar eclipse if you were living at Chaco Canyon 1,000 years ago. What would you have been thinking? 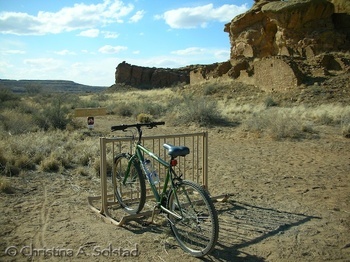 Entering the loop road at Chaco, on Thursday morning, I felt so amazingly happy, and just cried with joy to be there! Just me and the park and a few other visitors. Then on a stormy Saturday the sun came out (briefly) with a lovely light on everything (top photo is Hungo Pavi, bottom is view from Hungo Pavi), followed by the pouring rain at Pueblo Del Arroyo, and a short time later the snow (yes, snow!) blowing sideways at Casa Rinconada. What are your special moments at Chaco? 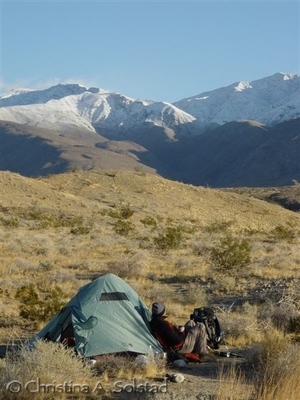 Winter in the Anza-Borrego Desert, east of San Diego - 8 pm, and we’ve been tucked in our sleeping bags, inside our tent, for the past hour. The rain has started up again. Earlier, the moon shone through a break in the fast-moving storm clouds, so we ventured out for one last bit of the desert night sky before hunkering down in our cozy tent for the night. 8 pm – earlier than I went to bed as a child. But that is one of the pleasures of camping – living by your natural circadian rhythms – to bed with the night sky and arising with the dawn. I have a feeling the storm will give way to a glorious morning, with the post-rain freshness and vitality I love. So now I sit here listening to the patter of the rain on the tent – coming down hard, then just a light tap, barely discernable.